Ever seen this pop up in Internet Explorer 6 (or 7)? This page contains both secure and nonsecure items. Do you want to display the nonsecure items? You spend hours combing through server-side source, hours more combing through client-side source, and yet more hours sniffing and poring over headers, and nothing. Nothing HTTP when it should be HTTPS. If you attempt to vaporize that div with removeChild(), you’re suddenly no longer secure. Okaaay. Make sense to you? Makes sense to me! Programming in Fortran is like a monarchy: With the right guy, it’s not so bad, but there’s just too much potential for abuse. Hence the URI Decomposer was born. You’ll find it among the items on the Tools page (few as they are as of this writing). I’m starting to do some rudimentary audio editing on the Mac. Not impressed with Audacity version 1.2.5 for the Mac. The most glaring oddity is when exporting a file. As I type the file name, Audacity starts playing the audio. Evidently Audacity does not disable its keyboard shortcuts (not related to the Save dialog, that is). Awfully flaky. That’s not to mention the rough-around-the-edges UI that makes a Mac user cringe. Guess I’m just spoiled. So, the common way to set the property of an HTML element is, according to the standard, right out? I mean, it’s not inconceivable that I would want to create a <button> on the fly with a type that is not the default. Works like a charm! Even in IE6. What have I been doing, lo, these many months to keep me away from the blog? Two new redesigned websites. Allow me to elaborate. I worship with the Pepper Road church of Christ in Athens, AL, and for years now, I’ve been responsible for the church website. I have fulfilled that responsibility with varying degrees of effort, attention, and responsiveness—lacking in all more often than not. I finally have gotten around to building the site within a content management system, namely Joomla!. Now, instead of my being the sole soul who can edit the website, our elders, deacons, and minister can author content themselves, and I have a couple of backup administrators, too. 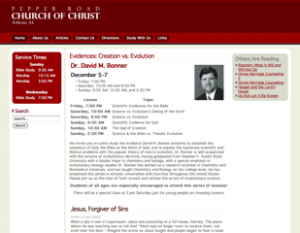 We have information about the church and articles on Bible topics. Soon we should have sermon audio back online, and after that, we hope to have an introductory Bible correspondence course online. I’m pleased but not content with look. In the interest of getting the new site out the door quickly, I have used a free template from Joomla Shack. It’s fine; it’s just not custom. I hope to get around to designing something that says “church” a little more than this borrowed template. When I do, this space will certainly reflect it. Not quite a year ago, I took a job with USinternetworking (to which a friend had sold his small business specializing in e-commerce website development in IBM’s WebSphere Commerce). 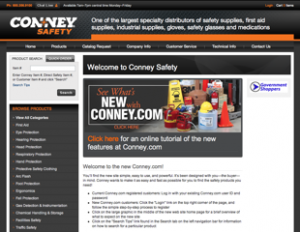 The first site to go live that I’ve had a hand in is Conney Safety Products. Conney is a safety product wholesaler. The website offers a quick order feature, shopping lists that can be shared among all of the buyers in your company, and a live chat with Conney support personnel. There are a few post-go-live features that we are finishing up, such as an improved search utility. Look for that in the next few days. If you sell safety supplies, drop by conney.com. While we were looking at one of the endangered species exhibits (I forget now which), Kevan piped up, asking why, if we subscribe to the theory of evolution, are we concerned when any animal becomes “endangered?” Isn’t that just evolution at work, weeding out the inferior species? Then it occurred to me. Evolution theory says that mankind—uh, humankind (sorry) is simply nature’s most evolved species. In other words, we’re not outside of nature; we’re very much a part of it. So what’s the harm if our behavior causes other species to fall out of existence—species less capable, less fit, less able to adapt? Such is the binding arbitration of evolution. So is mankind—uh, humankind part of nature or not? Can we just make up our minds already? 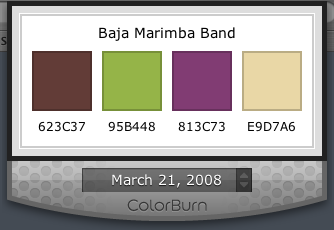 Web designers will be glad to know that ColorBurn is back! Shortly after the first of the year, ColorBurn just stopped working. I looked around on the Net for an explanation, but all I could find were others also wondering what had happened. I had given up hope, assuming that the guys at Firewheel just got tired of maintaining it. But here they are with entries for today and the last week as if they never skipped a beat. I am now the proud owner of a Mac. That’s right, as of Valentine’s Day 2008, I am the cool guy on the right, not the geeky guy on the left. Well, OK, it’s gonna take more than an Apple product to make me cool.